Raised by two Swiss graphic designers, Luke Geissbühler was taught the principals of color, shape and visual balance early in life. While earning his undergraduate degree in cinematography at New York University, he honed a gift for the mechanical as a Bolex technician, taking apart intricate spring-wound cameras under the watch of an elderly sage master. Upon graduating, he was hired by the prestigious effects studio R/GA where he worked on visual effects for high end commercial clients. After years of intense work in motion control, blue screen, digital compositing and tabletop photography, he began to pursue his career as a freelance cinematographer. During the 18 years of production since then, Mr. Geissbühler has been called upon to shoot features, commercials and documentaries all over the world for the likes of Jay Roach, Adam McKay, Barry Levinson, Barbara Kopple, Doug Liman, David Byrne, Jane’s Addiction, Warner Brothers, 20th Century Fox, Universal, and Sony Pictures in addition to commercial clients such as Volkswagon, Captain Morgan, Nike and Victoria’s Secret. The vast diversity of his work has informed a style of classic naturalism and delicate control. His documentary work is a continuous study of natural light, human movement and simply doing more with less. His narrative work brings factors of control, beauty and storytelling that inform his approach on a daily basis. In this pursuit, he has lensed successes as varied as Helvetica, Borat, The Muppets and Deadline. His aim is always to develop unique and powerful looks for any project that he takes on, with ideas that are tailor made to support the work of the director and the story first and foremost. Aware of the environmental effects of traditional film production, Luke has always looked for the most captivating, low impact methods of photography, and has been an authority on cutting-edge HD cameras and innovative production methods for years. 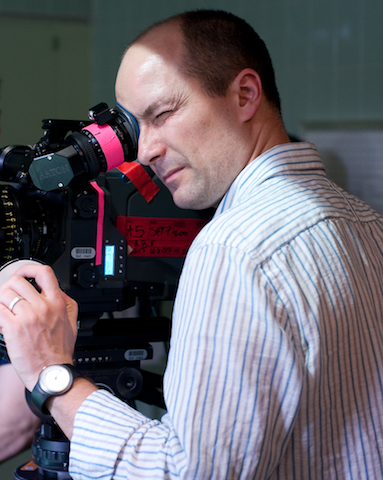 He has served as an advisor to Arri Panasonic and Red on their HD cameras. He is an avid runner, self taught engineer, designer of two electric vehicles and once sent a camera to near-space and back, just for fun. Some of his sixteen feature films include the award winning Acts of Worship, Mail Order Wife, and Borat: Cultural Learnings of America for make Benefit most Glorious Nation of Kazakhstan. Some of his long form documentary work includes Barry Levinson’s Hard Ball, Barbara Kopple’s Bearing Witness, Janes Addiction’s Three Days, as well as the design documentaries, Helvetica and Objectified. Luke is presently filming Urbanized, the third of the Helvetica design series and will be beginning photography of a feature thriller project in the Arctic. He has just completed photography on the HBO pilot The Miraculous Year directed by Kathryn Bigelow.